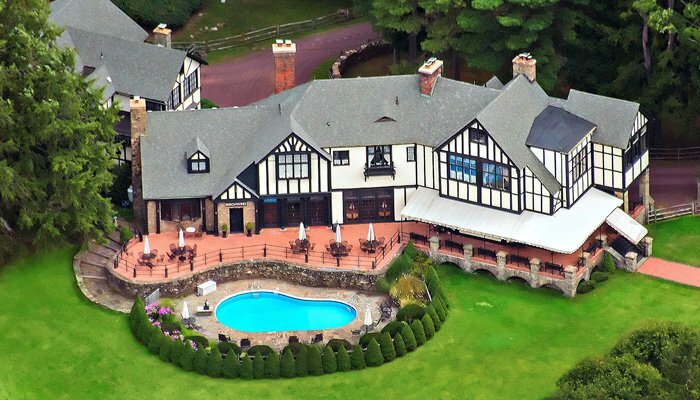 We invite you to enjoy the beauty of the Pocono Mountains during your stay at the Bischwind Bed and Breakfast. Here you can unwind from a busy world -- rediscover nature and enjoy a magical reality. If you are searching for peace, elegance, and great food, Bischwind belongs to you. The mansion, listed on the National Historic Registry entices history buffs who will love eating in the Presidential Dining Room, which has hosted Theodore Roosevelt, William Howard Taft, and Sikorsky, or sleeping in the Roosevelt Bed, almost a twin to the Lincoln Bed in the White House. Four-course cooked to order country breakfasts will fill you for the day! Be it a romantic interlude or an executive conference, Bischwind has the desired ambience. 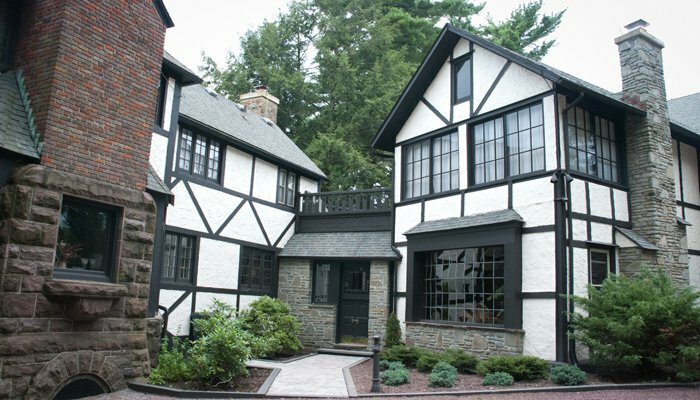 Bischwind has rooms and suites with fireplaces, private baths, and Jacuzzi Brand whirlpool tubs plus common rooms with crackling fires, executive seating, and terraces overlooking the garden, as well as all the amenities you would expect in an English Tudor Country Manor. Graveled and shaded roads around the sixty-acre lake surrounded by century-old pines will delight all who want to experience the unspoiled beauty of the Poconos. 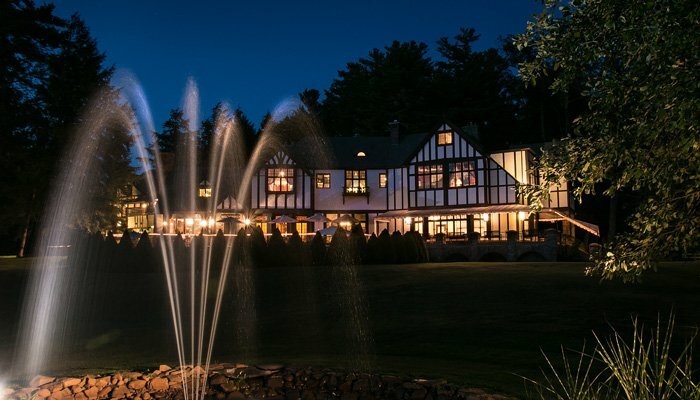 Hikers, bikers, skiers, golfers, antiquers, lovers rafter, crafters, and all those who might want to ride a train, pick a brain, visit a coal mine and miner's village, have tea in an English garden, or just sit and read will love this Pocono Mountain retreat. Relax with a refreshing dip in the on-site swimming pool. Albert Lewis, a lumber and ice baron who built Bischwind in the 1890's, and his historic accomplishments ... all told, you will step back in time and experience the hospitality of yesteryear. Enter the historic mansion of Bischwind where you will find peace and relaxation. Each of our guest rooms offers a retreat from the hustle and bustle of every day life. Be it king or queen, you'll be pampered in our soft linens and bath amenities. 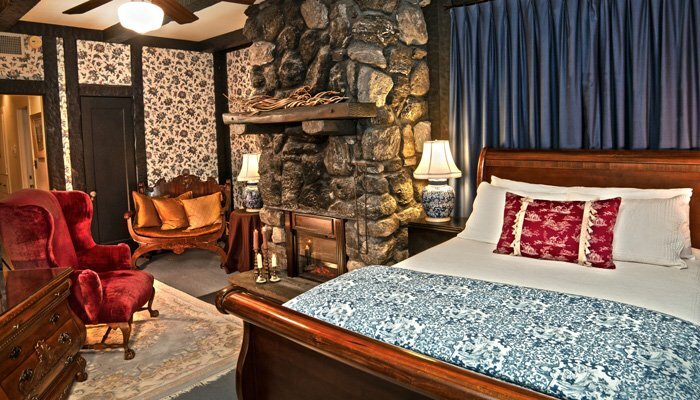 Your in room fireplace will add that extra touch of romance. Each guest room has en suite with plush towels and cozy robes. Take a Tour of Bischwind Inn!